What is a Driver Helpful DOT Physical? Helping drivers and motor carriers is what we do. Drivers with certain medical conditions need a medical examiner who not only knows the medical requirements, but who is interested in helping the driver maintain their livelihood. At the same time, our driving status determination provides the safety aspects that motor carriers expect and need. Pass Your CDL Medical Exam! 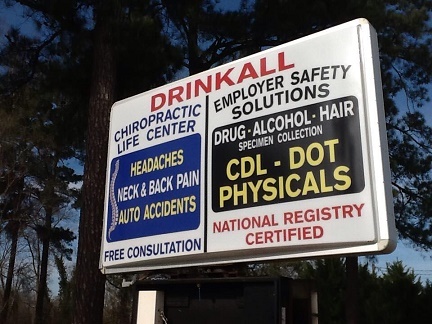 Dr. Drinkall knows how important it is that you continue your livelihood as a commercial driver. With his extensive knowledge of the DOT Physical Exam medical guidelines, Dr. Drinkall will steer you through the DOT Physical Exam requirements so you can Keep on Truckin’. Looking for a DOT Physical Exam or CDL Physical Exam in Newberry, South Carolina? You’ve come to the right place! Conveniently located 2 miles off of Interstate 26 at exit 72. Take exit 72 (SC HWY 121) towards Newberry for 2 miles and we are located on the right. If you reach a traffic light, you have gone too far! We Have Friendly, Driver Focused Staff as well as Truck Parking! Tritown Chiropractic Offices Jordan C. White, D. C.